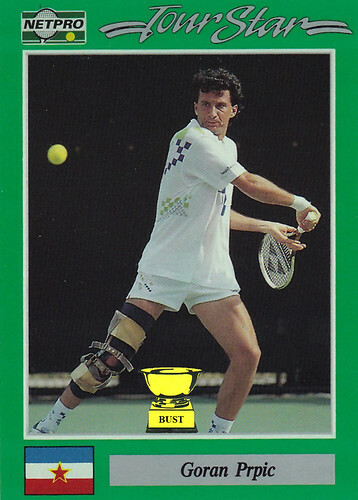 Value of card: Two broken VHS copies of "The Terminator"
We can rebuild him: Tragedy struck Yugoslavian tennis star Goran Prpic in 1986 when he was involved in a high-speed donkey cart accident, nearly costing him his leg and severing almost all the vowels from his surname. Inspired by "The Six Million Dollar Man," which had finally premiered in Yugoslavia, the nation's heads of state called in their top physicians, not just to heal Prpic, but to make him faster, stronger and better at tennis. But, being Yugoslavia, the doctors didn't have much money to work with. So, instead of being fitted with a bionic knee, Prpic was given a gigantic leg brace made of masking tape, cardboard, velcro and dog collars. And while it didn't make him any better at tennis, it did provide him with a couple extra places to store tennis balls.